With the addition of features and multi-touch gestures first pioneered on the iPhone and iPad, Lion is truly different than any other Mac OS. This handy guide is packed with concise information to help you quickly get started with Lion, whether you're new to the Mac or a longtime user. Once you learn the essentials, you can use this book as a resource for problem-solving on the fly. 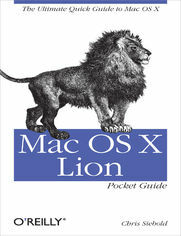 Mac OS X Lion Pocket Guide goes right to the heart of Lion, with details on system preferences, built-in applications, and utilities. You'll find configuration tips, keyboard shortcuts, guides for troubleshooting, lots of step-by-step instructions, and many other features&#8212;all in an easy-to-read format. 1. Whats New in Lion?